Home » Read an Exclusive Advance Excerpt from Clive Barker’s The Scarlet Gospels! Read an Exclusive Advance Excerpt from Clive Barker’s The Scarlet Gospels! Hellraiser fans! Horror author Clive Barker has a huge treat in store for you this May with the release of his new novel, The Scarlet Gospels. Two of Barker’s most popular characters–supernatural detective Harry D’Amour and the Cenobite hell priest Pinhead–come together in an intense and complex tale that will take readers to Hell itself. Harry follows the lead Cenobite to the underworld after Pinhead kidnaps Harry’s dear friend, a blind medium named Norma Paine. Fans can expect to learn much more about Pinhead and his origins, and can also look forward to an ingenious and creative look at the hell where he now resides. Wicked Horror will continue to provide you with news about this exciting novel as it comes from St. Martin’s, and be sure to look for our review of The Scarlet Gospels when it is released on May 19, 2015. 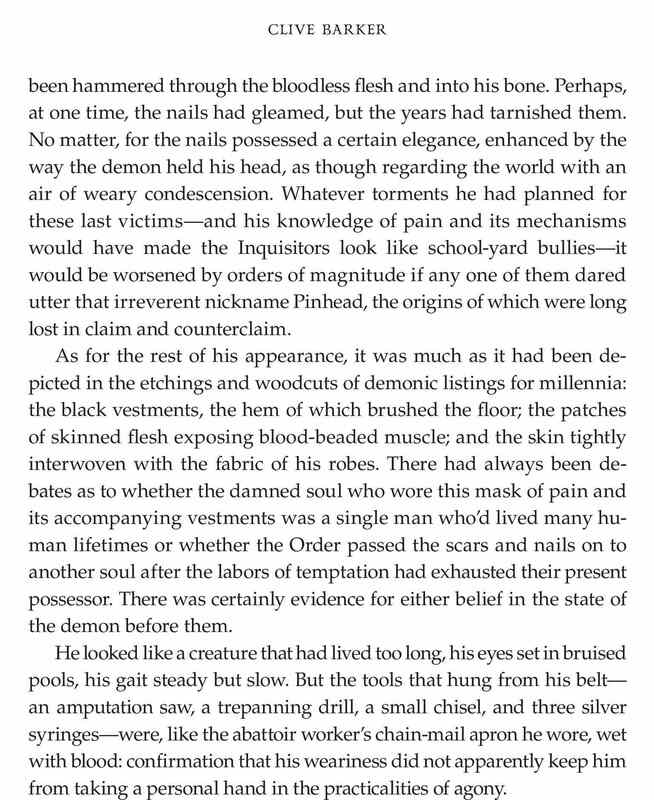 For now, we hope to whet your appetite with this excerpt from the beginning of the novel-a beautiful introduction for our favorite master of pain and torture, Pinhead! Be sure to read Nat Brehmer’s Four Reasons You Should Be Excited for The Scarlet Gospels and keep an eye out for our review of the tome in the coming days!